A Film By Jamie Kastner, "There Are No Fakes"
Hot Docs, North America’s largest documentary festival, offers an outstanding selection of over 200 films from Canada and around the world to Toronto audiences of more than 200,000. 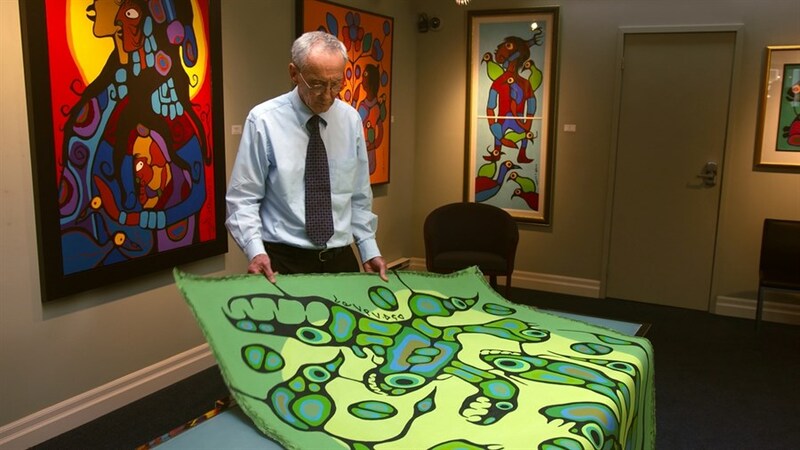 The 2019 Hot Docs Festival will run April 25 to May 5, 2019.
Notable art dealer Jack Pollock, who first discovered Morrisseau, liked to drop into Kinsman Robinson Galleries after leading his local art tours. Pollock is pictured admiring Norval Morrisseau’s mighty Sacred Eagle With Circles of Life painting. Jack said that he was glad that Kinsman Robinson Galleries represented Morrisseau at this stage in Norval’s life. In an excerpt from Pollock’s memoir titled Dear M, he recalls the first time he met Norval, “As I walked in, [Morrisseau] scared the sh*t out of me because he started chanting and banging a drum. He was having fun, really having me on—a brilliant, brilliant manipulator. But then he went over to the table and picked up a brush and did this magnificent painting—and scared the sh*t out of me again. I got goosebumps. I knew he was a genius.” Courtesy McClelland and Stewart. The gallery welcomed Norval Morrisseau to the stable in 1989 and hosted his comeback exhibition "The Shaman's Return" from March 31 to April 28, 1990, an event which wowed collectors and critics alike. Kinsman Robinson's principals possess extensive experience and knowledge of Norval Morrisseau’s art. Kinsman Robinson Galleries acted as Norval Morrisseau's primary gallery from 1989 until his death in 2007, so we’re well-versed in Norval Morrisseau’s genuine paintings and their unique qualities. Kinsman Robinson Galleries specializes in Norval Morrisseau paintings of exceptional calibre and significance. Since 2008, Kinsman Robinson Galleries has held five biennial Norval Morrisseau retrospectives with accompanying full-colour exhibition catalogues. Cover painting: "Portrait of the Artist in an Ancestral Image", acrylic on canvas, 48x40 ins., 121.92x101.6 cms. 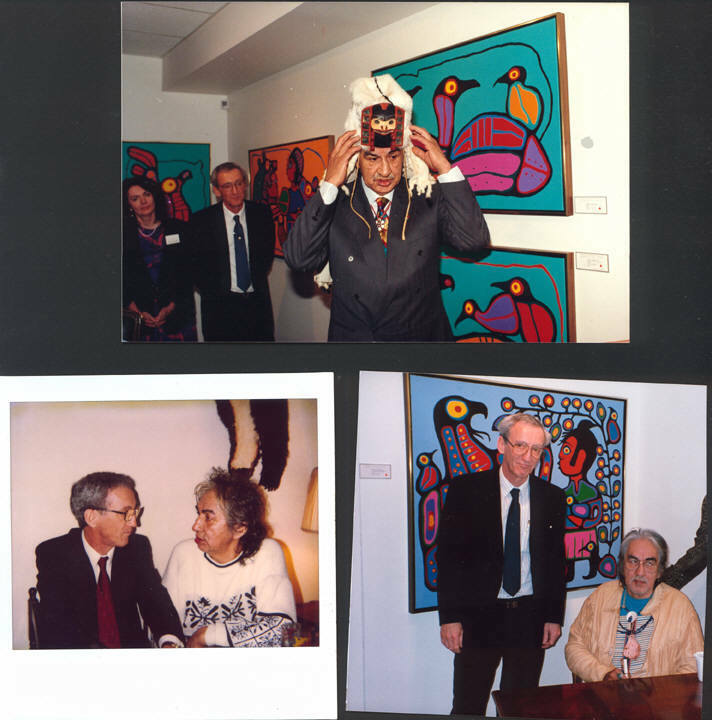 Clockwise from top: Norval Morrisseau (1991) with Diane Kinsman and Don Robinson at Morrisseau's second Kinsman Robinson exhibition; Norval Morrisseau (1997) with Don Robinson at another sold-out opening; Norval Morrisseau (1989) with Don Robinson meeting in Aldergrove. Newly consigned from two individual collectors, they were each purchased during Norval Morrisseau's lifetime, only having been in the one collection since coming to KRG from the artist's studio. Painted edge-to-edge on 300lb. 100% rag paper, they're signed 'Copper Thunderbird' in syllabics. They are framed to conservation (archival) standards. A combination of poor record keeping, the effects of living a nomadic lifestyle and a youthful desire has led to considerable confusion surrounding Norval Morrisseau’s date of birth. Let's set the record straight. Correspondence appears to confirm Norval Morrisseau’s date of birth as March 14, 1931. 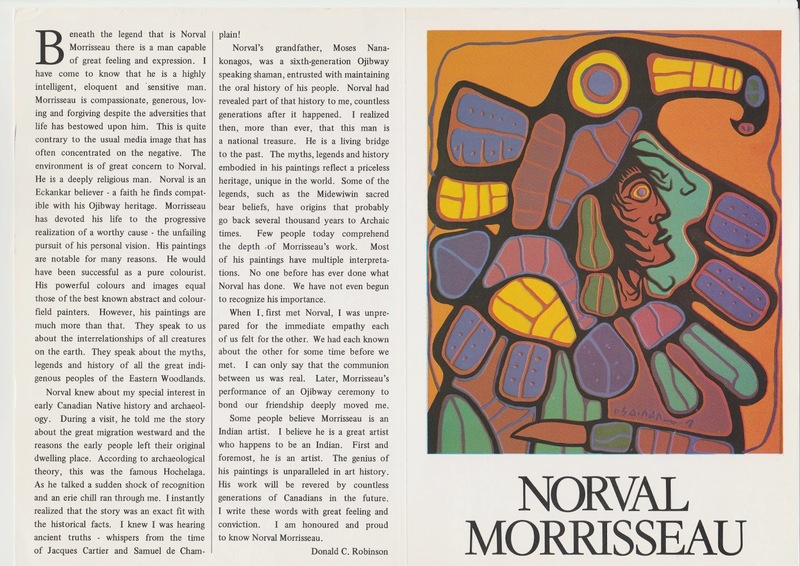 Various media reports from 1962, at the time of Morrisseau's meteoric rise to the top of the art world, state his age as 31. Norval's then-manager confirmed that Norval agreed at the time. 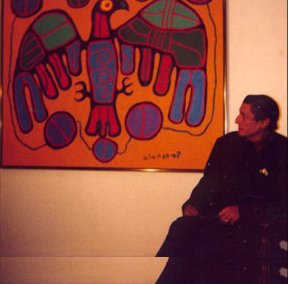 An avid collector of Morrisseau art, Dr. Bernhard Cinader, (D.SC Immunology, 1958), located Norval's medical records prior to his own death in 2001. Norval agreed with those records. Moreover, the year 1931 became an established fact when Norval Morrisseau applied for a Canadian passport to travel to France for “Magiciens de la terre” a contemporary art exhibit at the Centre Georges Pompidou in 1989. Michele Vadas, Morrisseau's caregiver over twenty years, offered the following explanation. Norval, even if he knew, would have liked the fact that the year 1932 made him appear younger and that it placed his birth date in line with the year Elizabeth Taylor was born. Norval had a long-held fascination with Taylor, at times even comparing her to his own mother. Flap copy: Norval Morrisseau is perhaps the greatest Native artist ever to have lived. He is a shaman, a storyteller and the inspiration for one of Canada’s most vibrant and exciting art movements, the Woodland School of Art. Through his magical paintings he has given new life to ancient Native legends and fables and has helped to restore the dignity of his once-proud people. This new edition introduces numerous previously unpublished works to the book, as well as commentaries by collectors who have followed Morrisseau’s artistic development through the decades. It also includes Duke Redbird’s The Ballad of Noval Morrisseau, a deeply spiritual poem that personifies the power the artist’s paintings have for his people. A true celebration of the art and life of this remarkable man, Norval Morrisseau: Return to the House of Invention, provides insights into the artist’s imagination and mastery of his medium. In three essays, and the quotations that accompany the paintings, we learn about Morrisseau’s approach to his work and the important historical and cultural influences that shaped his art. He tells us, in his own words, about his travels to the dream-like House of Invention, his source of inspiration for both content and colour. 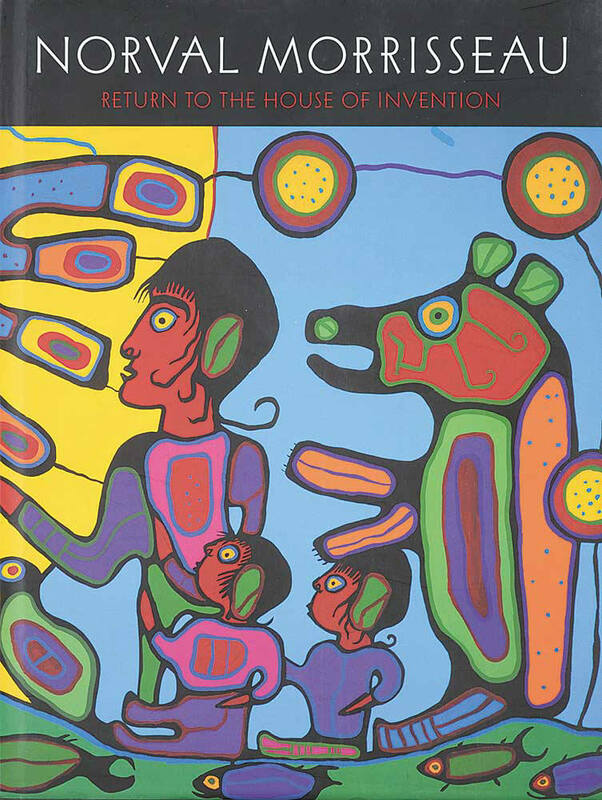 In Norval Morrisseau: Return to the House of Invention, we learn of the myths and legends of his ancestors, which had a profound influence on his brush, and how they relate to his work. The book now contains paintings and other pieces created over Morrisseau’s entire career. 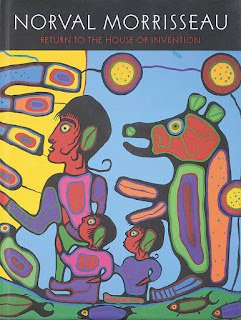 It is complemented by an essay by Donald C. Robinson, in which he describes the painter’s unique approach to the physical act of painting, and explains how Morrisseau has developed as a master technician and colorist despite having little formal training. Norval Morrisseau is truly one of the most original and significant artists Canada has ever produced. This exceptional volume stands as a testament to both his incredible talent as a painter and his inspiring depth as a man. In the artistic journey of Norval Morrisseau, the unstoppable progression from simple graphic narrative to rich harmonic structures within structures has given the world a breathtaking libretto of Ojibwa legends and sacred imagery, within unsurpassed orchestrations of colour. For those meeting Morrisseau’s paintings for the first time, the direct, flat-shaped compositions appear to be narratives with limited subjects, shallow dimensions, and random though responsive colour choices. Longer acquaintance to this master painter’s work inevitably reveals deep complexity in his colour choices and a highly refined sensitivity to colour resonances more equal to the intricate chords and sequences associated with European symphony. The analogy of colour to music is historically comfortable, allowing a general way to understand how colour can, like music, operate in chords, keys, and harmonies that can be “in” or “out of” tune, sweetly harmonic, or terrifyingly, deliberately dissonant – and how, in the hand of a genius these nuances of resonating frequencies can create emotional states of great power. Norval Morrisseau’s use of complex, sometimes dissonant chords and colour sequences move us through excitement and quiet, joy and awe. He knows how to quicken our visual pathway and how to slow it; to compel our eyes to dart from one corner of the canvas to another; to make the edges of our teeth tingle with a nails-on-chalkboard yellow against a plaintive mauve; to tease with counterpoint; and yet to hold the whole in exquisite balance. Refined orchestrations like these are well known to the epicure, to the wine connoisseur, to the composer, the choreographer, the architect – in short to anyone who has spent a great many hours in contemplation of the subtlest nuances of sensory experience. Morrisseau did not use colour wheels and manuals to direct his choices, but like Van Gogh, he had a prodigious natural instinct that, through continual exploration and aspiration, developed the ability to feel his way unerringly around passages of unusual colour with extraordinary sensitivity to the impulses and overtones of each selected hue. Like the work of the Dutch artist, Morrisseau’s work should never be considered just technical wizardry. These two artists shared a deep drive to express a state of being that moved beyond the quotidian: Van Gogh in his intersection of landscape and raw emotional response, Norval in his intersection of the spirit world and reverberating storytelling. The truthfulness of Morrisseau’s shamanic vision is not to be underestimated. His narrative landscapes were as strongly in his sight1 as the French landscape was in the plein air observations of Van Gogh. Morriseau’s early wide ranging colour palette was determined by the materials he was able to access, “anything he could find”: pencils or ink on paper, etched birch bark, and various qualities of paint, often chalk tempera or poster paint.The earthy primary tones and neutral palette of the years from ‘59 through the early 60’s were possibly encouraged by friend and anthropologist Selwyn Dewdney – perhaps out of a sense that these would be more “authentic” to an artist from such a remote background, following the thinking of a Eurocentric art perspective. This palette remained a part of Morrisseau’s colour vocabulary into the 1970’s. Certainly, the earthy reds, yellows and green support the graphic strength in pieces such as Sacred Beaver, 1969, or The Dream of the Indian, 1973, or the nestling birds and insects of the Untitled paperwork of 1972-3. But any expectation that this unique artist would or should continue on in this “natural” palette would have been to confine him to the Native art apartheid decried by Carl Beam in 1992. 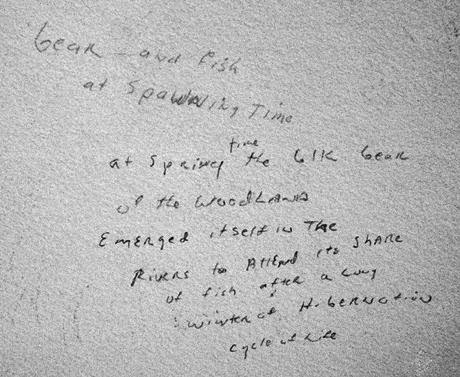 Fortunately, Norval Morrisseau’s forceful talent was to absorb the energies of his surrounding environment, redefining them through his exceptional shamanic lens.Thus the meeting with Toronto gallerist Jack Pollock that resulted in his sold-out first exhibition of 1962, provided a significant introduction for Toronto to the powerful imagery of this northern visionary, and for this visionary Morrisseau, to the broader art scene in Toronto – a Toronto flamboyant in the aftermath of the Painter’s 11 and a Canadian art scene including colour works as various as Toussignault, Riopelle, Bush, and Markle, and of course, Michael Snow’s ubiquitous Walking Woman. Clearly seen in the evolution of his colour palette, Morrisseau was not insensible to the currents surrounding him, nor to the (then) expanding spectrum of acrylic paint colours. 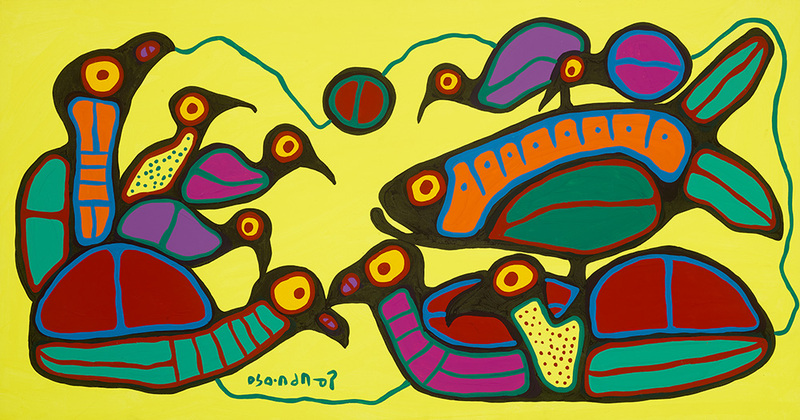 As early as the 60’s Morrisseau was exploring the primaries of clear bright colours with particular leaning towards the colour vibrations (now termed “luminance”) that modern acrylics could provide, as seen in the Thunderbird (acrylic on paper), 1968. Here as well, were the beginning contrasts of transparent colour vs. opaque colour.Later on, transparent colour washes would be used to demarcate alternate planes of existence and portals. Within five years, his investigations of pairing complementary hues along with introducing modern synthetic intermediary hues like the “new” hot pink and violets were evident. Sacred Trout, 1973 is a beautiful example of the insertion of synthetic magenta, bright orange and clear cyan breaking into the simple harmony of the traditional primary palette. By the time Morrisseau’s work was exhibited in Paris, at Magiciens de la terre, the 1989 contemporary art exhibition at Centre Georges Pompidou, the surety with which the artist wielded cools and warms, simultaneous contrasts, dissonant resonances and chromatic chords all structured in every conceivable tonal and saturation variation, put the artist in a category of colour mastery that has certainly justified the moniker “Picasso of the North”. When we look at Copper Thunderbird | Wabino-Wiin Shaman of 1992 (image above), we are looking at a mature composition with a highly sophisticated balance of unnatural colour placements: rich yellows and heavy reds against light blues or light teals; an arresting central red/orange surrounded with many focal points including hot pink and luminous yellow punctuations. Yellow is the most difficult colour to control on the two dimensional plane, and this composition strides with all manner of yellows, the whole business as electric as Mondrian’s Broadway Boogie Woogie. The riot of dancing energy however, is held back from fracturing only by the field of subdued tempered yellow, and with the finality of the canvas edge. That tempered yellow, and the small diluted yellow-green framing Copper Thunderbird’s face are the only quiet voices that ground the eye just enough, before it moves off again into the tensions, the explosions of power and life. Although harmonic, the work is not flaccid. Although balanced, it is not easy. The tensions hold the viewer riveted, but never trapped. In this astounding masterpiece, Morrisseau gives us a visceral experience of the metaphysical power embodied in the shaman. He gives us a glimpse of the raw complex life-energy of an artist/visionary who hears the sacred symphony of being. When it comes to online research about Norval Morrisseau, much has been written about forensic analyses. Last year, a New York trial court held that handwriting expert testimony was not "scientific". Nonscientific experts are "experientially qualified" — that is to say, their experience largely is their expertise. 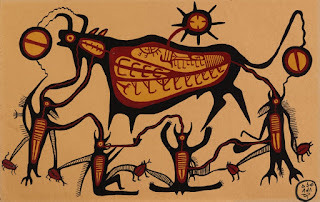 Yet few experts have ever witnessed Norval Morrisseau draw, paint or sign anything. In reality, Norval Morrisseau rarely signed any absolute genuine paintings on the reverse, and if he did, they were more likely than not titled only in pencil. Morrisseau's distinctive combinations of lowercase and uppercase cursive letters are easily discernible by anyone with significant experience with the painter. Paul Robinson personally inspected hundreds of genuine Morrisseaus as he inventoried all of the remaining artwork in Norval Morrisseau's possession at the artist's Nanaimo studio during Spring, 2001. "I think I know Morrisseau's work as well as anybody," said Mr. Robinson, 50 years old. "The enormity of disinformation by a few individuals with a vested interest in selling fakes is a travesty," he said. Armand Garnet Ruffo, Queen’s National Scholar in Indigenous literatures and languages, has a new poetry book inspired by Norval Morrisseau paintings titled The Thunderbird Poems (Harbour Publishing, 2015). From the publisher: "Deeply immersed in Norval Morrisseau’s life story, and possessing thorough knowledge of the Ojibway storytelling traditions which grounded so much of the artist’s creativity, Armand Garnet Ruffo provides fresh poetic interpretations of the most renowned and striking works of one of Canada’s most celebrated painters. The Thunderbird Poems delves into Morrisseau’s creative life through compressed, imagistic language, while untangling the complex and powerful threads of meaning, tradition and emotional power that resonate throughout Morrisseau’s strong lines and vibrant colours." Watch out for Armand Ruffo's recent interview on CBC Radio, The Next Chapter with Shelagh Rogers. 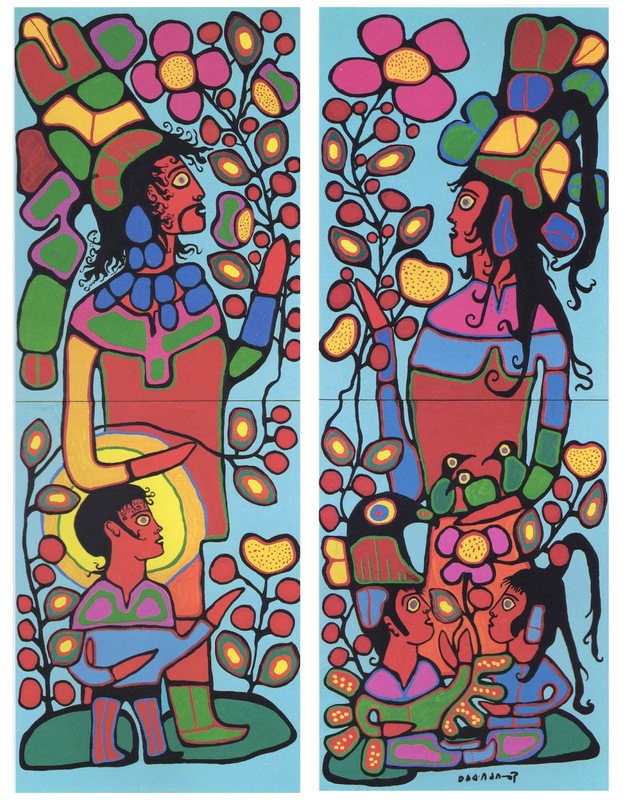 Since 2008, KRG has consistently held biennial Norval Morrisseau retrospectives with accompanying full-colour catalogues. This year's catalogue features poems written by Armand Garnet Ruffo, Associate Professor in the Department of English Language and Literature at Queen's University, to accompany select illustrated paintings by Norval Morrisseau. 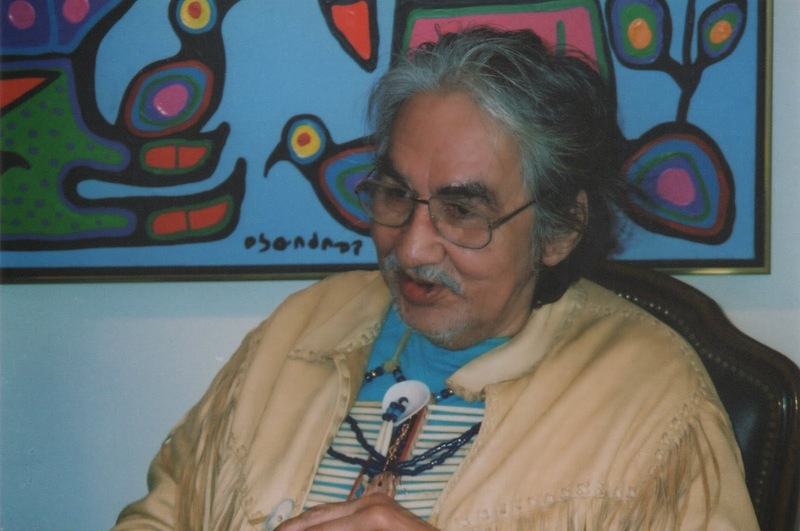 Armand is pictured on November 15, 2014 signing copies of his new Morrisseau biography "Man Changing Into Thunderbird" at Kinsman Robinson Galleries (Douglas & McIntyre, 2014). 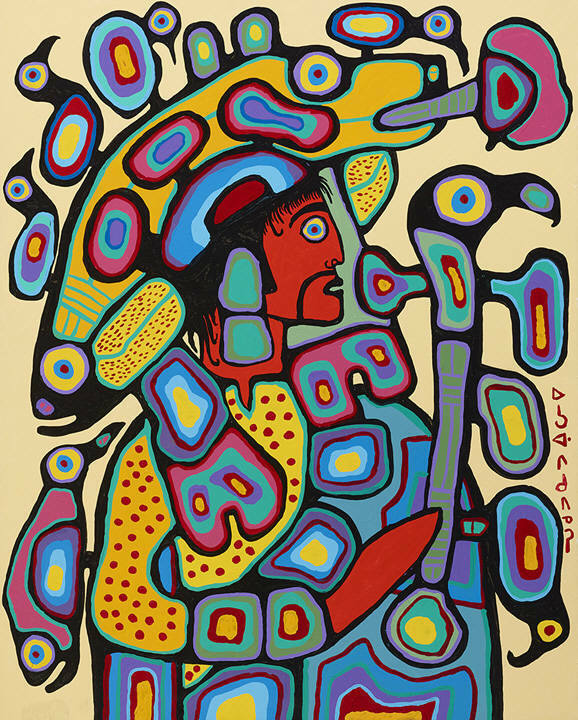 Norval Morrisseau's major dealer and principal gallery is showcasing the fourth retrospective of Morrisseau's artwork from Nov 22 until Dec 20, 2014. In 1989, the gallery welcomed Norval Morrisseau to the stable and hosted his comeback exhibition "The Shaman's Return", an event which wowed collectors and critics alike in 1990. KRG’s principals possess extensive experience and knowledge of Morrisseau’s artwork. The gallery co-authored two hardcover books along with Norval Morrisseau. 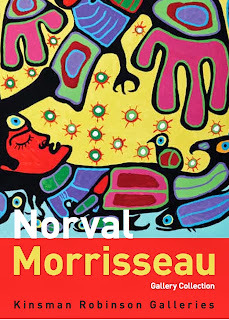 KRG has held four catalogued exhibitions since Norval Morrisseau passed away in 2007. Norval Morrisseau came to prominence following his first sold-out exhibition at Toronto's Pollock Gallery in 1962. Time Magazine (Sep 28, 1962) reported, “Few exhibits in Canadian history have touched off a greater immediate stir than Morrisseau's.” It's a statement that was true half a century ago and still holds true today. Five decades later, Morrisseau's artwork is notable for its kaleidoscopic colour, bold black outlines and sacred imagery. His signature style has cemented the artist as an icon of Canadian art. A rock star of the art world, Norval Morrisseau enjoyed regularly attending his exhibition openings. KRG made every effort to ensure Norval Morrisseau's comfort and safety at all times, from hiring private security in order to discourage visits from obsessive fans to renting medical equipment, wheelchairs and adjustable beds, to aid with his hotel stays. Mr. Robinson and KRG specifically caution against drawing any undue inference of truth from the woefully ignorant and intentionally deceptive comments posted on YouTube. Norval Morrisseau was always present at his shows of his own volition. Make no mistake, Norval Morrisseau experienced fame and enjoyed his celebrity status. Photo: Norval Morrisseau on 7 May 1994 photographed at the opening of his third solo exhibition "Honouring First Nations" at Kinsman Robinson Galleries. Courtesy Kinsman Robinson Galleries, Toronto. Originally published on 2/1/13. 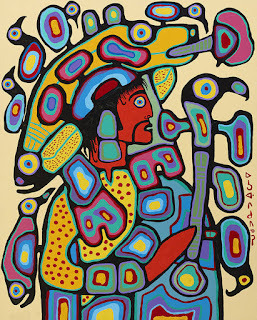 The artist Norval Morrisseau made clear his disapproval at the behaviour of numerous art galleries and auction houses regarding fakes, forgeries, breaches of copyright and moral rights in numerous letters, e-mails and affidavits—some dating back to 1993—sent out years before he succumbed to the ravages of Parkinson's disease. 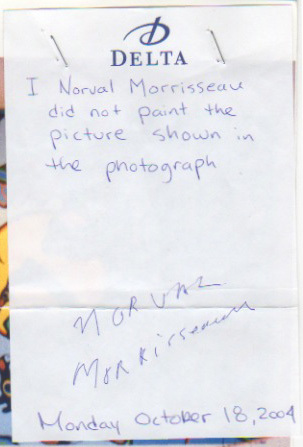 Some were as simple as a handwritten note on hotel stationary stating, "I Norval Morrisseau did not paint the picture shown in the photograph" (signed and dated 2004—pictured above). Many of the recipients simply ignored Norval Morrisseau's requests. Acrylic on canvas, 96x36 ins., 243.84x91.44 cms. 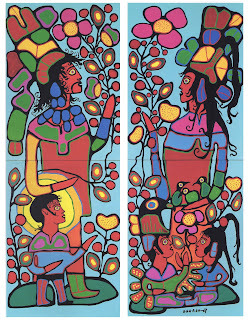 »On December 18, 2013 at approximately 7:35 p.m., the above-described paintings by renowned Anishinabe artist Norval Morrisseau were reportedly stolen from a private residence in Tiny Township. OPP received a call from an alarm-monitoring station and responded to the scene within minutes of the break and enter according to the owner. Today, the paintings are valued in excess of $200,000. They were purchased by the present owner at Kinsman Robinson Galleries. Norval Morrisseau is an iconic Canadian artist whose symbols and enduring artwork have become synonymous with Canada's national identity. A number of Norval Morrisseau artworks in public collections are certified as being of "outstanding significance" to Canada's national heritage. If you have any information concerning the whereabouts of these paintings, please call police at 705-526-3761 or Crime Stoppers at 1-800-222-8477, or send a tip online. Crime ref. : OPP13395779. This notice was circulated by the Executive Director to the member galleries of the Art Dealers Association of Canada on January 30, 2014. Image detail: Norval Morrisseau, Shamanic Vision, 1996, Acrylic on canvas, 48x36 ins. Art copyright © 2013 Norval Morrisseau Estate. Lecture open to the public, donations welcomed. Aboriginal artist Norval Morrisseau whose entrance onto the Canadian art scene in 1962 introduced a unique artistic language steeped in Anishinaabe cultural traditions. Melding oral narratives, personal storytelling, and a visual language that draws on Indigenous visual elements, Morrisseau’s art serves as a hybrid form of visual narratives that draw on a range of influences in order to shape stories on canvas that reach back to the past, take from the present, and exert a transformative influence on the future. This lecture discusses works by Morrisseau that confirm the importance of narrative in his art and acknowledge the multi-layered stories embedded in his artwork. Kinsman Robinson Galleries fondly remembers our eighteen-year association with Norval Morrisseau, also called Copper Thunderbird. 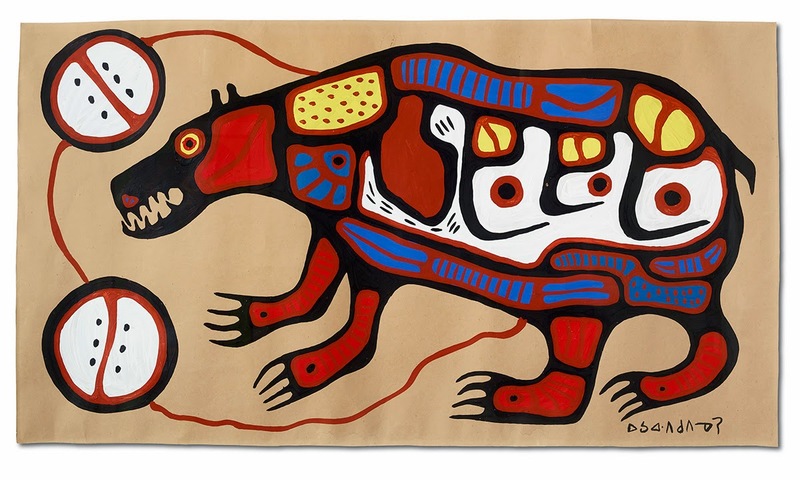 Norval Morrisseau was one of the most influential indigenous artists of the 20th century. Like Canadian art pioneers, Tom Thomson and Emily Carr, Morrisseau inspired successive generations of visual artists to pursue their own visions. Morrisseau was a Grand Shaman, a passionate storyteller and the inspiration behind one of North America's most colourful, instantly recognizable and notably original art movements, the Woodland or Anishinaabe School of Art. Photo: Morrisseau pictured in 2004. Copyright by Roberts Studios, 2004. Kinsman Robinson Galleries has accepted Internet blogger Ugo Matulić's offer to settle our defamation lawsuit against him. Based upon an agreed statement by the parties involved, the settlement of this case was approved on 16 May 2013. Our decision to agree to this settlement was made in order to end the ongoing distraction and cost of a complex litigation process. KRG has operated as a fine art gallery for thirty-three years. As longtime members of the Art Dealers Association of Canada, our practices are fully consistent with both the law and accepted standards in the art world. KRG will continue to pursue our moral commitment to protect the artistic legacy of Norval Morrisseau and to preserve the value of genuine works by the artist. 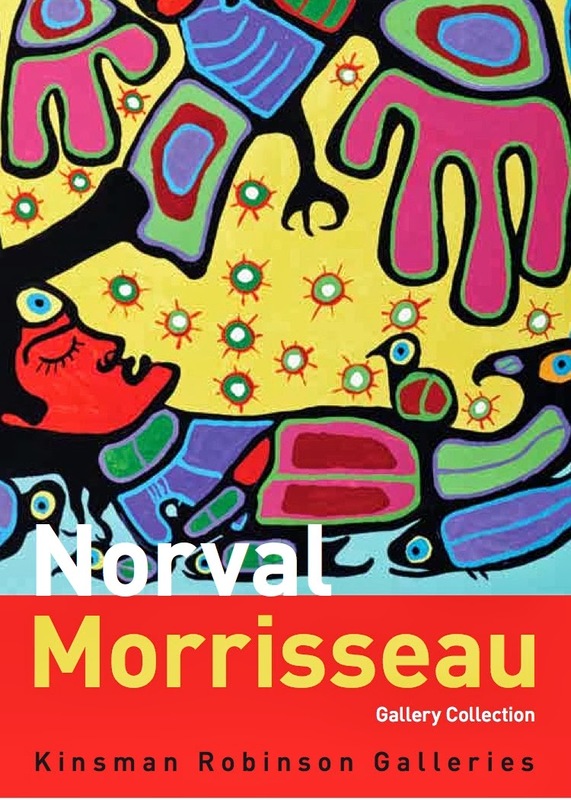 In keeping with the concept of droit moral (in this case the artist's right to not claim authorship of a work), Norval Morrisseau publicly disavowed the black drybrush paintings over a six-year period beginning in 2001–through the formation of the NMHS in 2005–until a month before he passed away in 2007. With no inducement, Norval Morrisseau returned his first statutory declaration to KRG in 2001 wherein he stated unequivocally that he did not paint the subject paintings. The Visual Artists Rights Act amended U.S. law granting the moral rights of attribution and integrity to American visual artists in 1990. A recent Ontario court ruling demonstrates that Canadian artists cannot rely on moral rights protection equal to their American or European counterparts for that matter. In this case, authorship of a work is being attributed to Norval Morrisseau against his will. Clearly, Norval Morrisseau took the necessary steps–during his lifetime–to ensure that such artwork was not attributed to him in perpetuity. 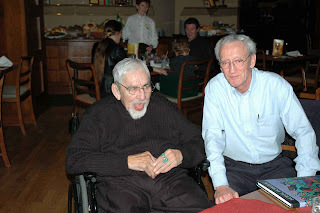 Photo: Norval Morrisseau with longtime art dealer Donald Robinson pictured in 2004. Copyright by Roberts Studios, 2004. Cited by Donald C. Robinson in his introduction to Norval Morrisseau Exhibition: ‘Honouring First Nations’ (Kinsman Robinson Galleries, Toronto, 1994). 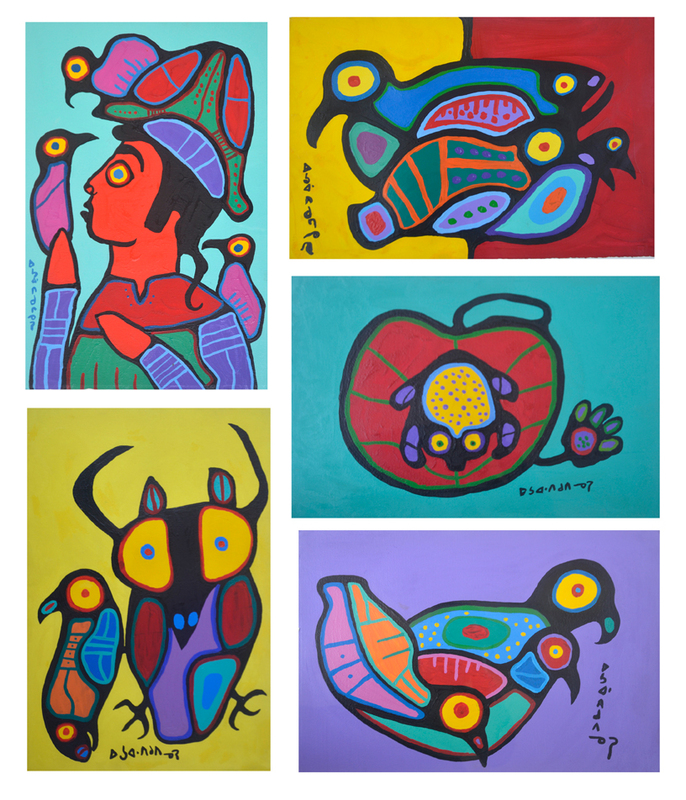 "My first visit to Norval Morrisseau's studio had a profound effect on me. That day, Norval told me that he had been thinking about me for some time, but we had never previously met." 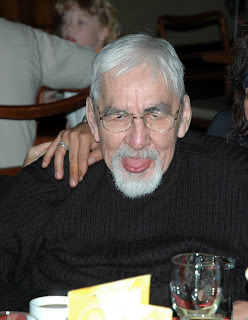 In a fitting tribute to Norval Morrisseau, Robert Houle, a close friend and contemporary Anishnabe Saulteaux artist, wrote, "As a master narrator, [Norval] had a voice that thundered like the sentinel of a people still listening to the stories told since creation." A family-owned gallery since 1980, Kinsman Robinson Galleries specializes in Contemporary Indigenous and Canadian paintings, sculpture and int’l works on paper. Kinsman Robinson Galleries enjoyed a long-standing and close relationship with Norval Morrisseau, C.M., LL.D., D.Litt., RCA, RSC (1931-2007). The gallery welcomed Norval Morrisseau to the stable in 1989 and hosted his comeback exhibition "The Shaman's Return", an event which wowed collectors and critics a year later. Kinsman Robinson's principals possess extensive experience and knowledge of Morrisseau’s art. Kinsman Robinson Galleries acted as Norval Morrisseau's primary gallery from 1989 until his death in 2007, so we’re well-versed in Morrisseau’s genuine paintings and their unique qualities. Kinsman Robinson Galleries specializes in Norval Morrisseau art of exceptional calibre and significance. Since 2008, Kinsman Robinson Galleries has held five biennial Norval Morrisseau retrospectives with accompanying full-colour catalogues. Kinsman Robinson Galleries welcomes and encourages your commentary and debate. However, we request that you restrict your comments to pertinent matters. Kinsman Robinson will not tolerate any comments that are abusive, threatening, defamatory or libelous, or attacks, ad hominem and otherwise, on fellow posters. Should you engage in this behaviour or otherwise violate the rights of other posters, Kinsman Robinson reserves the right to pursue any and all remedies available to it, including, without limitation, restricting, suspending or terminating your access to this site, without explanation, prior notice and liability. Neither the authors of the works published on this site, nor Kinsman Robinson itself necessarily agree with any comments. The editor will not correct spelling or grammar. Kinsman Robinson reserves the right to edit or delete comments entirely. Any comments the editor deems inappropriate will be removed from the site without explanation, prior notice and liability. If you feel a comment is inappropriate, please inform info@kinsmanrobinson.com, and we will review the material for possible deletion. Kinsman Robinson will not be liable in any way for comments posted on this site, and by using this site, you acknowledge and agree that sensibilities vary among people and that you may be exposed to comments you find offensive or otherwise objectionable. Art copyright © 2019 Norval Morrisseau Estate. Photography copyright © 2019 Michael Cullen/TPG Digital Art Services unless otherwise stated. Text copyright © 2019 Kinsman Robinson Galleries. ALL RIGHTS RESERVED. No component of this site, including images, text, video and computer code, may be reproduced or copied in any form or by any means—electronic, graphic, digital or mechanical, including photocopying or information storage & retrieval systems—without the prior express written permission of the copyright holder(s).